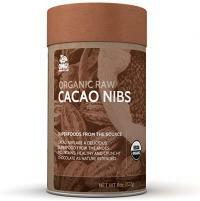 If you love raw cacao, you might be wondering about cacao nibs' nutritional info. Cacao and chocolate-lovers everywhere will be glad to know that nibs are really just a shelled version of the raw bean. Cacao beans are simply the seeds of the cacao tree. The term "nibs" is used to describe the product that results when these seeds are shelled or peeled. Usually, the inner cacao "meat" falls apart to make nibs, which can be purchased roasted or raw. Cacao nibs' nutritional info is basically the same as that of the beans, aside from the absence of a negligible amount of fiber in the shell itself. Though the health benefits of this particular raw food have become quite controversial, many people still believe that cacao is a natural and healthy pick-me-up for raw foodists and casual chocolate lovers alike. One ounce of raw cacao nibs contains approximately 130 calories and has about 12 grams of fat, seven of which are saturated. Raw cacao does not contain trans fats. It's important to note a couple of things about the fat content of raw cacao versus that of refined chocolate products, such as milk chocolate. Raw cacao is usually much lower in fat than milk chocolate. Milk chocolate and lower-grade chocolates usually contains a high amount of added sugars and milk, which raises their caloric and fat contents. Raw cacao may not raise blood cholesterol in the way that some comparable foods do. Antioxidants are substances that may inhibit the growth of diseased cells in the body. So, for obvious reasons, these powerful little molecules get a lot of attention in the news. Antioxidants occur naturally in some foods, such as red wine, green tea, and chocolate. Ounce for ounce, raw cacao has purportedly many more antioxidants than those and other nutritious foods. Most people know that chocolate contains caffeine, although it is usually a negligible amount. Raw cacao, from which chocolate is made, contains much less caffeine than either coffee or tea. Though cacao isn't a high source of caffeine, it does contain a couple of different naturally occurring stimulants that may have the potential to improve mood and increase energy. Some believe that these stimulants may also help decrease appetite. Theobromine - Theobromine is a very mild stimulant that is probably the reason some individuals feel energized after consuming cacao or chocolate. Additionally, some evidence suggests that theobromine can be very harmful to certain animals, like cats or dogs. Phenylethylamine - Another stimulant, phenylethylamine acts with the body as an antidepressant and is believed to improve mood. Like most foods in their raw state, cacao nibs contain a much higher concentration of vitamins than their refined byproducts do. Here are a few of the vitamins that are found naturally in cacao. vegetarian, vegan, gluten-free, and kosher, so it can be used in a variety of diets and with many different lifestyles. This flexibility has helped to bring this raw food into the mainstream dining scene.